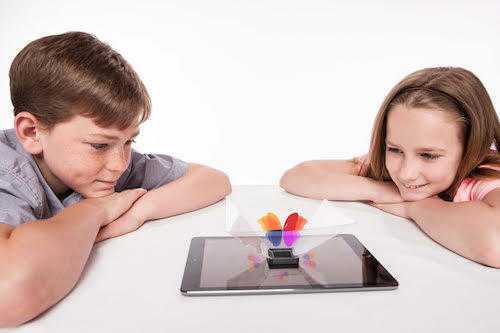 Now you can project and view PepperGrams on you Tablet with this DIY hologram pyramid! In this case, bigger is definitely better! The plastic used to make the PepperGram Projector, DIY hologram pyramid is super thin - why? To prevent the formation of a double image. BUT... The DIY Hologram Pyramid does not create a hologram! So if it's not a hologram, what is it and how does it work? So, what does the DIY hologram pyramid do? What’s going on is a variation of an old illusion technique used in theaters and haunted houses known as Pepper’s Ghost. It was made famous in 1862 by one John Henry Pepper. But the very first mention of the effect was made long before that, in the 16th century by a Neapolitan scientist, Giambattista della Porta who is also one of the pioneers in optics.